Network18 Media & Investments' digital content and e-commerce business saw Q4FY13 revenues of Rs 110.4 crore, a 200 per cent growth from the same period last year but a 7.7 per cent fall on a quarter-to-quarter basis. Revenues for FY13 stood at Rs 400.9 crore, registering a growth of 193 per cent over the previous fiscal (adjusted for the sale of NewsWire18). Interestingly, the unit saw an improvement in operating margins from negative 54 per cent in FY12 to negative 31 per cent in FY13. This comes as losses remained mostly flat at Rs 125.4 crore, getting a boost from the sale of NewsWire18. Digital commerce now accounts for nearly 70 per cent of unit's revenues compared with around 50 per cent last year. The company's digital content and e-commerce business includes a string of news sites, digital commerce properties BookMyShow.com and HomeShop18 besides NewsWire18. The firm divested its entire stake in NewsWire18 during the last quarter and the wire service is no more a part of Network18. 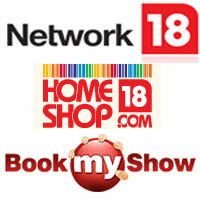 Network18 also diluted stakes in BookMyShow.com to venture capital firm Accel Partners and in HomeShop18 to hedge fund OCP Asia. The digital commerce unit's revenues dipped from Rs 84.4 crore in the last quarter to Rs 81.9 in Q4FY13. On a year-on-year basis, the unit saw revenues rising from Rs 118.8 crore in FY12 to Rs 276.3 crore in FY13. Revenues from BookMyShow.com grew 75 percent year-on-year but the major growth engine remained HomeShop18 which saw revenues increase more than 250 per cent year on year. "Our margins are looking significantly better and the television business is now generating operating profits," said a Network18 statement on HomeShop18. Revenues from the digital content properties such as moneycontrol.com, in.com, ibnlive.com and firstpost.com stood at Rs 28.4 crore for the quarter, up from Rs 22.4 in the last quarter. The revenue saw a 25.33 per cent year-on-year growth to Rs 88 crore. NewsWire18 delivered revenues of Rs 12.8 crore in Q3FY13. However, during the quarter, the firm announced that it had profitably divested its entire stake in the financial data and news terminal business to private equity firm Samara Capital for Rs 90 crore. Network18 Media & Investments' consolidated revenue for the quarter stood at Rs 679.5 crore. Its operating profit for the quarter was Rs 12.8 crore. The consolidated revenues for year 2012-13 stood at Rs 2400.8 crore on a reported basis, growing by almost 25 per cent over previous year's Rs 1943.8 crore.